Science is very much in the spotlight these days. The “March for Science” took place in Washington, DC on April 22, and many satellite “marches” were organized around the globe to coincide with Earth Day. Does science present challenges to our faith? Back in 2011, I was able to participate in an international conference on the vegetative state. Gathering in the City of Munich with 15 other researchers across Europe, we spent a week together learning about brain injury and how society responds to this challenging issue. Naturally, several of the participants wanted to know why a Catholic priest was interested in this subject. I explained how I was there to present the Catholic perspective on caring for patients in the vegetative state, particularly the teachings of the late Pope John Paul II (later to be St. John Paul II). After several days together, we had a great opportunity to share a traditional Bavarian dinner. In the middle of the meal, one of my colleagues asked me a question that surprised me. Being a professed atheist, she asked, “How can you study all the things we are learning about here, and still believe in God?” I asked her what she meant, and she explained how the findings of science can be verified by experiments; that is truth. So how can someone believe in things that cannot be proven? I said that belief in God, and the things He has revealed, are no less true than a scientific experiment. She disagreed. We both began to smile when she realized the reason I asked her those questions. I explained how my faith and love for God are true, and no less so than a scientific experiment. “The way that God loves me, and you,” I explained, “is true, as true as your love for your children, and their love for you.” Some things cannot be proven in a laboratory, but that does not mean they are not true. In our Gospel for this Divine Mercy Sunday, the disciples are gathered together in a locked room in Jerusalem, filled with fear and disbelief. They were incredulous, and for good reason. The man that they loved most—Jesus of Nazareth, whom they were convinced was the Messiah—was arrested before them, scourged and crucified. They stood by in stark disbelief as Jesus’ dead body was taken down from the cross and then laid in the tomb. Truly, they experienced a crisis of faith if there ever was one. Suddenly Christ walks into the room, through the locked door, and announces, “Peace be with you” (John 2:19). He was alive! They saw Him. To make sure that they understood precisely what they were seeing, St. John relates how “he showed them his hands and his side” (John 20:20). These were eyewitnesses to the resurrection of Jesus Christ. This was an historical event that was witnessed by credible people, who testified to it and later wrote it down. But Thomas the Apostle was not with them. Thomas would not believe what the other disciples told him. 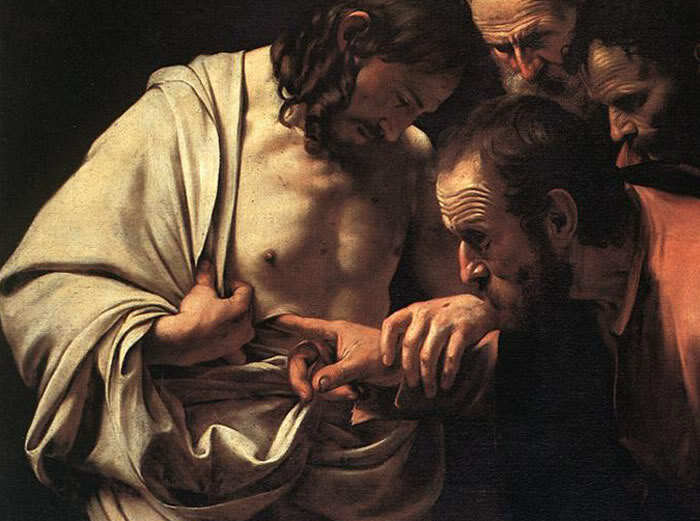 He defiantly declared, “Unless I see the mark of the nails in his hands and put my finger into the nailmarks and put my hand into his side, I will not believe” (John 20:25). One week later Thomas gets his opportunity. Once again, Jesus walks into the locked room and announces, “Peace with you.” And then He invites Thomas to inspect the nail marks, to place his hand into His wounded side. Astounded, Thomas exclaims, “My Lord and my God!” (John 20:28). Thomas, along with the other disciples, believed in the resurrection because they had seen the risen Lord. They believed in Jesus because they had proof, and there was no denying it. They saw the wounds with their own eyes. But they also believed, and perhaps even more so, because of what those wounds represented. God PROVES his love for us in that while we were still sinners Christ died for us. The Divine Mercy is proof for the existence of God; it is all the proof we could ever need to remind us that we are loved, called, forgiven, healed, wanted, and waited for by God. God proves his love for us in that while we were still sinners Christ died for us. In this you rejoice, although now for a little while you may have to suffer through various trials, so that the genuineness of your faith, more precious than gold that is perishable even though tested by fire, may PROVE to be for praise, glory, and honor at the revelation of Jesus Christ. Although now for a little while you may have to suffer through various trials, so that the genuineness of your faith . . . may PROVE to be for praise, glory, and honor at the revelation of Jesus Christ. The image of the Divine Mercy that Jesus entrusted to St. Faustina is marked by the powerful phrase: “Jesus, I Trust in You.” That is faith. When we experience betrayal, rejection, suffering, sorrow, we entrust ourselves to Jesus Christ. We make an act of faith and commit ourselves to following Him, even and especially when the road is dark and there seems like there is little hope. We place our hope in the promises of God, and not the shaky foundations of useless promises abundant in our culture today. Our love for God is proven in the fires of adversity, but it is a love that flows from His own generous cross and the Divine Mercy that first captivated us. “We love, because he first loved us” (1 John 4:19), and that love is constant. Friends in Christ, the question of God’s existence and whether or not He loves us has already been answered definitively by Jesus Christ. God proves his love for us in that while we were still sinners Christ died for us. But the question that remains for us to answer in this coming week is whether or not we will love Him, whether or not we will place our trust in His mercy. Are you and I willing to answer, “Yes,” to that question? Prove it.